If there are supermen among us, one of them showed his strengths last night in the ordinary metropolis of Cincinnati. Paul McCartney, age 69, demonstrated extraordinary endurance while plowing through a setlist that mere mortals would sell their souls to have written. While there is no question that the old Beatle is a living legend, Sir Paul surely put to rest any speculation that his talents have waned. He is as captivating as ever, delivering nearly three hours of flawlessly performed classics with as little apparent effort as that which you and I expend sitting on our talentless bums. So influential is McCartney’s catalog that selections from it successfully comprised the entirety of the pre-show music. 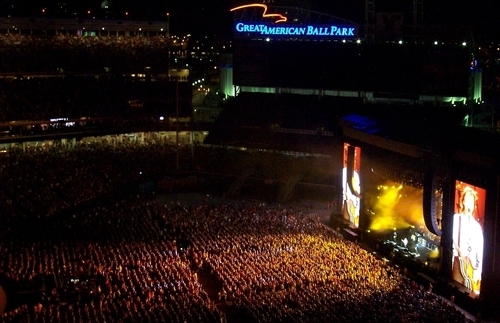 As concertgoers wandered the breezy concourse of Great American Ball Park and swarmed numerous swag stands, they were treated to a diverse array of cover tunes, from a Hammond organ instrumental of Eight Days A Week to a reggae version of Blackbird. For half an hour before the show began, a scrolling video collage of McCartney memorabilia was accompanied by an infectious remix mashup featuring Coming Up, Twist and Shout, Goodnight Tonight, With A Little Luck, Temporary Secretary, We Can Work It Out, Back in the USSR, and inevitably, The End. Then, with audience anticipation at its zenith and the video screens displaying a sparkling silhouette of the iconic Hofner violin bass, McCartney and his band opened with Hello Goodbye followed by Junior’s Farm. Throughout the night, McCartney kept his audience guessing by nimbly striding back and forth across his half-century career, stopping in the sixties to play Drive My Car, vaulting forward to the present for Sing The Changes (from 2008’s Electric Arguments with side project The Fireman), then back to ’65 for The Night Before. The first of many guitar changes came next as McCartney strapped on a colorfully custom-painted Les Paul to play the recurring lead riff on Let Me Roll It, which concluded with a brief instrumental jam to Jimi Hendrix’s Foxy Lady. Sir Paul explained the tribute to the younger ones in the audience, recalling that Hendrix had paid him a great honor by opening a show with Sergeant Pepper’s Lonely Hearts Club Band just two days after the album had been released. McCartney described Hendrix’s wild soloing, observing that “in those days, that would send your guitar wildly out of tune.” According to Macca, Hendrix’s historic and histrionic Pepper rendition was followed by a sheepish plea to audience member Eric Clapton to retune his guitar. A McCartney concert is not only an evening with an historic musician playing his historic songs, it’s also a chance to see some instruments that have become historic themselves. The man’s guitar rack is a traveling Rock and Roll Hall of Fame. “We’re showing off,” deadpanned Sir Paul as he explained the frequent guitar changes and switched to a ’64 Epiphone Casino. He then led the band into Paperback Writer, which was recorded using the very same guitar. A set of songs featuring McCartney at the piano followed, starting with The Long and Winding Road and Nineteen Hundred And Eighty Five. Lead guitarist Rusty Anderson used a slide to double the notes of keyboardist Paul Wickens, producing a wonderfully brassy and full horn sound to accompany Let ‘Em In. Anderson shone again with the classic solo to Maybe I’m Amazed. Then it was just McCartney and the audience, and no one can hold a baseball stadium full of fans captive with just voice and guitar like the lad from Liverpool. The swirling acoustics of the venue created cavernous echoes throughout the show, a drawback most times but a beautiful enhancement when McCartney played solo. He prefaced an exquisitely rendered Blackbird by explaining its origin as a nod to civil rights struggles. That the beautiful tune echoed off the walls of the nearby Underground Railroad Freedom Center and across the Ohio River made the number that much more profound. And yet the idealistic Beatle was playing his song to a homogeneous sea of white faces, enabling all to enjoy a dose of irony with the profundity. If the crowd was not racially diverse, however, there was certainly a vast range of ages present. First-generation Beatle fans rubbed shoulders with teenagers who, despite their youth, seemed impressively familiar with McCartney’s oeuvre. Seated near me was a quartet of teen boys who appeared to be especially taken with all things Wings, joining their thumbs and spreading their fingers into a flighty “W” whenever they heard the opening notes of a hit from the seventies. Though their preoccupation must certainly make them the geeks of their high school, they were not alone among the passionate crowd within Great American Ball Park. A new generation stands poised to acknowledge their cultural debt to the Beatles and to keep Apple in the black for a good, long time. “Hands up, those who’ve tried to learn Blackbird [on guitar],” McCartney asked, and hundreds of hands shot into the air, including those of the Wings teen fanboys. He spoke of how he and George Harrison would regularly attempt to one-up each other by demonstrating their proficiency at plucking out a particular J.S. Bach exercise. McCartney then played a bit of the piece, stopping to highlight a chord progression that inspired the famous opening of Blackbird. Before his band returned, McCartney provided one of the evening’s highlights, a moving performance of the John Lennon tribute Here Today. That a piece written immediately after Lennon’s death should remain as unflinchingly honest all these years later is a testimony to McCartney’s skill. Perhaps even more remarkable is his undiminished vocal range, which allowed him to cleanly hit notes even higher than those in the original recording. The foot-stomping Dance Tonight, featuring Sir Paul on ukulele, provided a lighthearted contrast, aided visually by cherubic drummer Abe Laboriel Jr.’s silly dance moves, which included everything from the Sprinkler to the Macarena. The comedy continued after Mrs. Vanderbilt, with McCartney relating how a recent Ukraine audience really enjoyed the “ho-hey-ho” refrains. By now nearly 90 minutes had elapsed since the start of the show, and the band was barely halfway through its set. McCartney himself had not left the stage, nor would he with the exception of the brief intervals before encores. Thunderous crowd recognition greeted the beginning of Eleanor Rigby, then it was back to the ukulele for Late Beatle Recognition Part II, in which McCartney honored George Harrison by playing a jaunty version of Something that morphed into a lush, full arrangement. Away went the uke, on went the Hofner, and Wings enthusiasts were treated to the evergreen Band On The Run. When the band got through the lengthy introductory bit and got to the meat of the song, I felt the surrounding stands tremble from the widespread fervor of the crowd. A good concert can be many things, but one of its greatest pleasures is providing its audience with a cathartic experience that temporarily whisks them away from their worries. Perhaps no song fits the bill better than Ob-la-di, Ob-la-da, which became the party song of the night. Long before McCartney exhorted everyone to join in, the crowd was lustily singing along. This good will continued through Back to the USSR and I’ve Got A Feeling, and the Great American Ball Park Chorus never stopped singing for the rest of the night. Another Lennon tribute following with A Day In The Life segueing into the chorus of Give Peace A Chance. Let It Be gave folks a chance to breathe before Live And Let Die, the traditional pyrotechnical showcase of a McCartney concert. This round of flames, explosions and fireworks was so over-the-top that it must have turned heads in Kentucky. He’ll have to retire the song now, as there really is nowhere else to go with the gimmick short of blowing up the audience. As the smoke cleared, McCartney led the second audience participation number of the night with Hey Jude, forever a crowd pleaser. He took a bow with the band and left the stage for the first time in two and a quarter hours, returning just two minutes later to encore with Lady Madonna, Day Tripper, and Get Back. Since it has long been de rigueur for pop concerts to have a planned encore, the bigger acts must therefore heighten excitement by building two encores into their setlists. Accordingly, McCartney and the band re-bowed and once again left the stage. Two minutes later, a solo McCartney appeared with his ’64 Epiphone Texan acoustic, as used to record Yesterday and also to perform it on The Ed Sullivan Show. Extra credit if you can guess what he played. There followed a non-musical and decidedly silly interlude, in which Paul honored a few zealots by inviting them onstage. First up were a quartet of young women who were notable not only for their fab Sgt. Pepper outfits but also for the fact that they had traveled from England and Australia to see the show. Then it was none other than the Cincinnati couple with the his-n’-hers “sign my wife” signage. Many in the crowd booed when she offered a shoulder blade to be autographed, perhaps anticipating something a little more risque for display on the video screens. Everyone, though, seemed to enjoy yet another example of Sir Paul’s dry humor, as evidenced when he preceded his signature with the motto, LET IT BE. A rousing Helter Skelter ensued, after which McCartney thanked the crew, as it was the last night of the tour. “We do have to go home, you know,” said Macca without a trace of weariness. “You have to go home!” It was a nice way to ease into the opening lines of Abbey Road’s great final medley of Golden Slumbers, Carry That Weight, and The End. As the throng wound its way through the concourse and snatched up the last available official merchandise, you could hear here and there snippets of conversation regarding the extraordinary and indefatigable energy of the old Beatle who hasn’t lost his knack for charming an audience. Was it a bird? Was it a plane? No! It was McCartney! 4 comments on "I Saw Him Standing There"
What an experience to see Paul McCartney!! I am quite sure that the crowd was much more enthused than watching the Redlegs play!! Brett – Yes, it was a wee bit more magical than your typical Reds game. However, I must say that Great American is one of the nicest places to catch a baseball game. Katie – Glad we could enjoy the show and some time together in Cincy. Karol – You’re quite welcome, and it was a pleasure to meet you.